David Nellist, retired gardener for the VA, with slide of building torn down to make way for hospital. 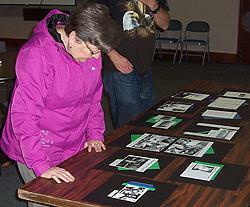 Audience member studying materials relating to early medical facilities in Lakewood. Tim Plante, Associate Administrator in charge of Patient Care Services for St. Clare Hospital. 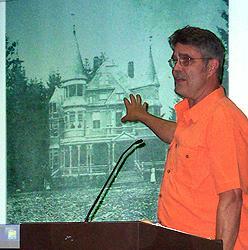 Lakewood Historical Society's Monthly Program for October, 2012. Long before there was a Lakewood—66 years before the opening of the Colonial Center, 125 years before cityhood—there was already a major medical facility in our area. And that facility is not only still operating, it's the biggest of its kind west of the Mississippi! That was just one of many fascinating facts laid out before a thoroughly engaged and responsive audience at the Lakewood Historical Society's most recent monthly program, The History of Medical Care in the Lakewood Area, held at St. Mary's Episcopal Church the evening of October 16. The facility in question, of course, is Western State Hospital, founded in 1871 on the grounds of what had been Fort Steilacoom. As the most senior medical facility by far in our area, it was fitting the evening's presentation began with an overview of Western State's history by Laurel Lemke, an employee of the hospital for 28 years. Today, Ms. Lemke is head of Grave Concerns Association, the organization responsible for rescuing and restoring the nearly-forgotten cemetery in which patients were interred from 1876 through 1952. The cemetery is near a few abandoned farm buildings, reminders of a time when Western State was self-sustaining, thanks to inmate labor in the fields and barns. The soil, mostly glacial till, made for poor crops until nearby Lake Waughop was dredged and the resultant muck spread across the fields. Today, lake, farm and cemetery are all within Fort Steilacoom Park, created from land that was part of the hospital's grounds until the early 1970's. Next in seniority to Western State is the Veterans Administration Hospital on the shores of American Lake. David Nellist, retired gardener at the hospital, spoke of its growth and changes to its physical plant and grounds since its founding in 1923 as a psychiatric facility for shell-shocked World War I vets. Today, one building is still dedicated to psychiatric care, but most are medical clinics, with the newest addition being a beautifully designed nursing home or Community Living Center. Except for the original Administration Building that was demolished when it could no longer meet the needs of an ever-growing hospital, every building from the earliest days still stands. And each is easy to place on a timeline of the hospital's expansion—the lower the building's number, the older the building. Like Western State, the VA Hospital also had its own self-sustaining farm (its barren, glacial soil also enriched by muck from a nearby marsh), and the two facilities would swap produce, providing whatever meats, vegetables, etc. the other lacked. Becky Huber, president of the Lakewood Historical Society, presented the story of another federal facility serving our local military: Madigan Army Medical Center on Joint Base Lewis McChord. Opened at the height of World War II in 1943 and expanded in 1944-45, Madigan was originally a sprawling complex with 80 wards connected by eight miles(!) of corridors. The spread-out design was a defense against the possibility of aerial bombing; if part of the complex was hit, the thinking went, enough would survive to continue operations. In 1985, construction began on a new eight-story hospital, completed in 1992 at a cost of $280,000,000. Built at an angle that gives each of its 400+ beds a view of Mount Rainier, the new Madigan is considered one of the finest medical facilities in the military system. Well supplied, then, with both state and federal medical facilities, the fast-growing suburb of Lakewood finally got access to a small private practice in 1946. That was the year a medical visionary by the name of Dr. Lawrence Skinner opened his Lakewood Clinic on 18 acres of land bought from the Catholic Sisters of Visitation Villa (site today of the Lakewood Towne Center). The LHS was fortunate indeed to have Dr. Skinner's son, James Skinner, relate his father's story. Sharing space with Dr. Richard Rich and dentist Dr Frances Smith, Dr. Skinner and his clinic supplied most of Lakewood's medical needs at the time, but he soon realized that as the population grew, more medical care than one clinic could provide would be needed. So, in addition to the clinic - and the professional village he built - Dr Skinner began pushing for the construction of a general hospital. In 1958, plans were drawn up and, after donating the land and rounding up the requisite number of physicians, Dr. Skinner saw his vision become reality when Lakewood General Hospital opened its doors in 1961. 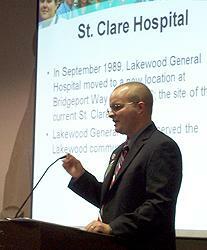 The subsequent history of Lakewood General was covered in the beginning of the evening's final presentation by Tim Plante, Associate Administrator in charge of Patient Care Services for St. Clare Hospital, Lakewood General's successor. Mr. Plante covered the history of medical care in the Lakewood area, and stated that in September 1989, Lakewood General Hospital, originally located on 100th and Bridgeport Way, was demolished and a new hospital built on 112th & Bridgeport Way SW. A year later, this hospital was purchased from the private, for-profit company by Franciscan Healthcare Systems (FHS), a non-profit, Catholic healthcare organization to become St. Clare Hospital, the second hospital in FHS. When the new Lakewood General Hospital was constructed in 1989, it was built with a wooden frame, limiting the ability to significantly expand the structure. Fortunately, FHS is a part of Catholic Health Initiatives (CHI), a nation-wide healthcare organization; and through the help of CHI, St. Clare Hospital is in the midst of a two-year, multi-phase $15.5 million renovation. The renovation includes a comfortable and tranquil new lobby, the new Heart & Soul coffee bar, a new patient registration area with increased privacy, an expanded outpatient laboratory, new gift shop, a larger cafeteria, a healing garden and walking path, and critical upgrades to mechanical, electrical, and life-safety systems. The renovation is scheduled to be complete in early 2013. Thanks to the successors of the Franciscan sisters who first came to Tacoma from Minneapolis in the 1880's to found St. Joseph Medical Center, Lakewood can count on future medical care that will likely surpass anything in its history.